In 2004 Stephen Pacala and Robert Socolow published a paper in Science in which they argued that a pragmatic, but still difficult, way of stabilizing atmospheric CO2 levels over the long term was via the implementation of seven “stabilization wedges” over the next 50 years. The idea was very simple: each wedge represented one in-hand technology or societal practice that could be implemented, relatively slowly at first and increasing linearly with time, to make a small but growing dent in the rise in CO2 emissions, stabilizing them at 2004 levels (about 7 Gigatons C/Year) over the next 50 years (see figure below). These seven wedges would be chosen from among a larger set of fifteen possibilities that included standard mitigation approaches such as increased energy efficiencies in vehicles and buildings, carbon capture at coal plants, nuclear power increases, and reduced deforestation and agricultural tillage-based losses. These practices would collectively buy time while larger scale transformations to renewable energies on a global scale could be developed and implemented that would drive emissions to zero over the following 50 years. This drastic emissions drop in the second 50 year period requires an immediate start on the research needed to develop and implement these technologies five to ten decades out, and the wedges themselves require a deliberate and committed effort, starting now. A couple of weeks ago, Socolow updated this work in a brief commentary piece to show where we are seven years later. The results are not encouraging. First, and most significant, rather than decreasing the emissions rate, the lack of implementation of these strategies has been accompanied by an accelerated rate of emissions, such that annual CO2 output is now just under 9 Gt C/yr, a 2 Gt/yr increase. Accounting for natural sequestration, this represents an increase of about 13-14 ppm CO2 over that time. But this is not the full story by any means. As Socolow notes, if we re-set the clock to 2011 and start the wedge strategy implementation now, it would now take nine wedges implemented at the proposed rate of the original seven, to accomplish the same goal (keeping emission rates constant over the next 50 years). Here is the real kicker however. 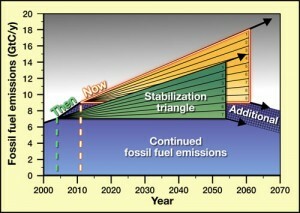 Even if we were to do so, starting today, with stable emissions for 50 years and then falling gradually from there to zero emissions over the following 50 years, an additional ~50 ppm of CO2 would be added to the atmosphere by 2111, relative to what would have been added had the seven wedge strategy been initiated in 2004. This equates to a roughly 0.5 W/sq m forcing increase, and a ~0.4 degree C global temperature increase, assuming an equilibrium sensitivity of 3 deg C per CO2 doubling and that the additional 50 ppm is added on top of the increase that would have occurred even if the 2004 wedge strategy had in fact been initiated. In other words, seven years of inaction, even if we immediately begin implementing the strategy now and fully carry it out over the next century, have larger climatic consequences over the next century than one might expect. So are we ready to begin that now, and the research needed for the drastic drops from 2061 to 2111 that the strategy requires, or will we be repeating this same story in 2018, with a couple more wedges required, and another 50 ppm or more likely in the pipeline and no commitment to the needed advanced technologies? You can read more about it, and commentary on it from some influential folks, here, here, and here. A thought-provoking piece, but I’m a bit confused. Isn’t CO2 output currently around 30 Gt a year? If so then presumably the figures in the article are just for the carbon? Sometimes our political process reminds me of the movie scene where Joe Pesci kills a rival by using a vise. The savage, bizarre excess of the process isn’t just destructive, it looks to be the activity of people who enjoy the harm they’re doing. Consider AGW, Peak Oil, our ruinous trade imbalances, and our involvement in Middle East warfare. In each case, developing alternate energy sources would be sane and humane, but our hoodlums-in-charge have us doubling down on carbon. The original wedge concept was based on stabilizing emissions in 50 years, and assumed a rate of increase for emissions lower than most other analysts were assuming. Then in 2006, China built 100 GW in coal. This analysis antedates the German decision to increase use of fossil fuels dramatically. 2 Jeffrey Davis: Reference book: “The sociopath next door : the ruthless versus the rest of us” by Martha Stout. New York : Broadway Books, 2005. According to Martha Stout, 4% of all people are born sociopaths/sciopaths/psychopaths. There is no cure because it is caused by a part of the brain simply being missing. A written test, the MMPI [Minnesota Multiphasic Personality Inventory] can identify sociopaths. Since sociopaths care about nothing and nobody, they are bored. They seek excitement constantly. You got it right. Good one, but it’s not really news to the people who read this blog and Climate Progress. The next stage has to be developing better ways to communicate to the public, because journalists obviously are not going to do it for you. Since 2004, there have been considerable improvements to renewable energy and the discovery of negative-emmission technologies. And we have tested and quantified the potentials of biochar better. But with no real action and still tolerating organized climate denial, there will be not enough change. You’ve got to read Dyson’s comment on the climatecentral.org link. I hope I die before I get old. I’ve sometimes wondered how the future forcing from suphate aerosols (currently ~ -1 W/sq m) can be expected to play out over the period that we hope to reduce fossil fuel burning, given that sulphate aerosols are caused by fossil fuel burning. That -1 W/sq m is an awful lot of negative forcing, enough that if it “suddenly” disappeared then we should “suddenly” expect the global temperature to increase by 0.8 degrees C. So trying to rapidly reduce fossil fuel burning also carries the risk of temporarily increasing global temperature, unless we want to do atmospheric engineering at the same time. I do not like my conclusions but I do not think that there is any indication that control of carbon will start anytime soon. This stated is only an observation of what is happening at the present and what has happened in the past in issues as contentious as is climate change. We as a society have lost the ability to understand a complex issue that harms the short term bottom line of big business. Why, realistically we have the news media where most people get their information being owned by big business and nor responsible to the public. This consolidation of the news media is a new event and has a short history of three or so decades. Plus the media wants controversies not settled science. A controversy sells people on consuming more media and that is better for their short term bottom line. We are in the era of both Truth Free Media and Truth Free Government. This issue is not about truth and never has been, it is about the short term bottom line. It has been fought by people who erroneously think that by providing the truth the public will understand the issues and force their governments to comply with reducing the burning of fossil fuels. Such silly thoughts have gotten us to the current place and keeps us continually distracted with the thoughts that governments will start to act for the long term good. No they will not, they only think about the next election nothing longer term comes on their radar. No we will not start to control carbon emissions for a long time. I can not reasonably see any meaningful control starting before 2020. I just attended a University lecture by the head economist of Alberta University that showed that it is more economical to control carbon at the 650 ppm level than either 550 or 450 which also appeared on his graphs. Nowhere in his talk did he mention 350ppm. Yes I was shocked but he had the sides with the arcane economic magical math to prove his point. Course why anyone thinks economists can project the future with any accuracy better than magic is another question. So when are we going to realize that we should start to talk about controlling at 450 and 550 because that is where economic thought is now and they have the ear of government and business. If you are not shocked then you live on another planet and do not crucify me, I am only transmitting the troubling information. So with people like him out there talking to governments just when do you think government will act? Not in the next election cycle (2012) that is for sure so we are looking at 2016 at the earliest for the question even to come up in a meaningful way, like there is a problem even to address. Then you have the inertia of society to change and it is terribly slow to respond ears like in the following election cycle not the current on it is voted on so add another 2–4 years for anything to start after it is voted on. That is where I get the 2020 as the earliest date we can look to reasonable start to control green house gasses and at what ppm will they be at with business as normal happening until then? So 2020 is the earliest and likely far to early at that. I think you are confusing Gt of C with Gt of CO2. 33 Gt of CO2 would contain about 9 Gt of C.
Somewhere that I can never find, there is a pie chart of all those wedges. Is carbon capture and storage is ready for prime time? That’s news to me. I agree with James Hansen that exploitation of the tar sand oils in Canada and elsewhere is a key to whether we will take steps to get carbon emissions under control. The fact that the Democratic administration is going full speed on the pipeline from Canada without even mentioning impacts on climate change bodes very badly for the future. On the other hand, we have Gov. Perry proposing “drill baby drill” on steriods with much reduced environmental safe guards. Where is the media balance. Why are environmental extremists on the right able to dominate the media? Until mainstream science is better publicized the future is bleak. Jim, my impression is that Lovelock’s remarks (without him reading the emails) has 2 side’s of the coin. Fudging climate data is a crime against humanity, committed by the people which trumped up the story in an orchestrated campaign, originating from Delingpole and McIntry’s blog and those who fund the denial machine. That aside, my point was that humans are to stupid to combat climate change, this means how to treat the denial machine and large scale action to prevent dangerous emission scenarios. Industrial civilization is in collective denial and disconnected from nature, and my impression is that most of the undeveloped world is uneducated on this. Interesting as Prof Socolow’s piece is, and with respect, I felt his current piece (as also their earlier article in Science) misses 2-3 core issues underlying global warming. One it does not deal with systemic traits that are inherent to capitalism, namely the drive for profit, the use of cheap energy (coal), and growth, which is central to the system. Two, they do not adequately deal with class, particuarly consumption by the better off. The above, in a nutshell, are why emissions have continued to rise and why political and financial elites don’t do anything about them. It’s very disturbing but hardly surprising. Prof Socolow persists in not addressing these core issues. Is not a simpler solution to just bring in an additional ‘Carbon’ tax, taking account of our best estimate of the damage caused, incorporating the chances it might be worse, the chances it might be better. We can do this gradually to minimise economic dislocation and adjust the price in the light of new research. We can also distribute the proceeds of this tax to make sure it is not regressive. Where there is economically attractive alternatives, these will quickly take over. Where fossil fuels including the carbon tax is still the most economically attractive, we are at least are paying a realistic price that includes the cost of the damage caused. Do these scenarios assume that the climate system will continue to sequester around half of our annual CO₂emissions? My understanding is that the oceans will cease to be a net sink around 2050 on the current path… a path which puts us at 2°C above mid-20th Century global temperature by mid-21st Century. It seems unlikely to me that the terrestrial carbon sink won’t also have turned into a net source around that time, or earlier. Is it physically possible to ‘stabilise’ global temperature at some much higher level of atmospheric CO₂that we choose, or will multiple positive feedbacks make that impossible? If the latter is the case then there must be a point at which no amount of emissions reductions will halt global warming. We would need to be actively removing CO₂from the atmosphere, and the only way I know of to do that which doesn’t require massive inputs of energy is biochar. However, if we’re already adding three times as much CO₂to the atmosphere as the entire terrestrial biosphere is capable of absorbing, there’s no chance at all of growing enough biomass to offset more than a small proportion of current emissions by converting to biochar. I suppose what I’m saying is that it appears to be too late to have any realistic chance of avoiding a very large rise in global temperature, however aggressive (and currently inconceiveable) our emissions reductions are. I’m not trying to be a ‘doomer’ but I just don’t see how it could be done, all things considered. It would be helpful to have a dollar amount for cost of a year’s delay if we limit ppm to the 500-550 Sokolow is aiming for, akin to the IEA estimate. The haloed 4th Estate model of the media was largely a result of World War 2. Before that the yellow press dominated. The heroism of lots of reporters and photographers — the famous photographs of D-Day, for example — raised the profession’s status. Then, for a a couple of decades the relative idealism of William Paley lifted entire news organizations up so that they appeared to have the status of a little less than angels. But that was solely the work of individuals. After Paley, people like Rupert Murdoch and Jack Welch have seemed to revel in destroying journalism’s status. The old, large news organizations today exist to advance corporate interests. The development of the WWW destroyed most of the rest of the financial resources of journalists, and today they are little more than PR men. Relying on journalism to spread the truth about climate change is a serious mistake. There are idealists here and there, but there’s almost no distribution structure for them anymore. This is a self serving, politically motivated, intentional lie. As a physicist, Dyson knows about the radiative properties of CO2, H2O, and other polyatomic gases. As a physicist, Dyson knows that even cold gases can excite some of their polyatomic gases to an isotropically radiative state. As a physicist, Dyson knows that water vapor isn’t well mixed, since it exists as a solid and a liquid in earth’s atmosphere. As a physicist, Dyson understands the Clausius–Clapeyron relation. As a physicist, Dyson knows the difference between measuring and counting, and that inherent measurement errors don’t falsify fundamental physical laws. As a mathematician, Dyson knows that the uncertainty in our measurements and modeling of those measurements, which lead to the statement that “a doubling of CO2 will cause an increase of global average temperature in a likely range of 1.5 to 4.5 °C, with the best estimate being 3 °C” doesn’t preclude catastrophic warming and secondary effects. As a mathematician, Dyson knows the difference between probability and risk, and that our uncertainty about how bad global warming will be makes his wish for inaction more, not less, dangerous. What insulting arrogance. Dyson’s not Galileo, and climatology isn’t faith based geocentrism. A (apparently) dirty little secret in this community is it’s not just ‘denialism’ that’s responsible for the failure of significant wedge mititgation strategy to be implemented. No one’s willing to look at environmentalists themselves. Of course there’s always going to be opposition to implementing various things for various reasons… but when you have local environmentalist opposition to projects that require local approval to get off the ground, this is a serious (and tragic) jeopardization of the entire project. These folks would represent the most informed on the subject, and the most motivated. Even ardent ‘denialists’ might still be convinced to welcome a privately financed increase of the tax base, but others may not be convinced about a project until after hearing the disapproval of a community environmentalist. With that in mind… until those committed to clean(er) energy are willing to put up with a wind farm, solar installation, biomass facility, natural gas installation, and/or nuclear power plant in THEIR backyard– none of these strategies is going to be more than just pillow talk and arm waving. And, judging from the number of such projects that have been proposed and then cancelled/rejected, it is this type of NIMBY hypocrisy that just might be more directly detrimental than science denialism. Cutting carbon emissions has not happened. Rather the amount of carbon release is increasing. For example from the US EIA “Most of the electricity in the United States is produced using steam turbines. Coal is the most common fuel for generating electricity in the United States. In 2010, 45% of the Country’s nearly 4 trillion kilowatt hours of electricity used coal as its source of energy.” Many US home renters depend on coal burning power plants to not freeze in winter or swelter in summer. Does anyone out there think that there will be action by the US Congress forthcoming to spend money or make rules to upgrade tens of millions of rental homes in the US? Globally coal mining is projected to increase not decrease, as long as there are reserves, at least until 2025. People in China and India want modern amenities that require electricity. Lots and lots more electricity. It is likely that worldwide we will burn every ton of coal we can get and still want more power from every other source available. Every fossil fuel source available is increasing production to the extent feasible. We are about to start mining tar sands on a massive scale in Alberta to feed the US market. Fracking is creating immense new wealth and natural gas burning is increasing. It seems that the best long term estimate of carbon emissions is a steady upward projection at or above the old worst case projections. Unfortunately the inaction is continuing and there is no prospect of that changing. There is near zero likelihood of carbon emissions coming down in the foreseeable future. No change in humanity’s behavior pattern is happening. I now think no change can be reasonably be expected until large scale environmental disasters cause such devastation that people are terrified into action. That will be a bit late. The Pacala and Socolow paper, much as I liked it and recommended it as a really good example of what we could do, now seems to have been ivory tower thinking not taking into account human nature in the real world. > No one’s willing to look at environmentalists themselves. When did you last check that? It’s a common claim, often refuted by looking. I can recommend Google’s natural language search; it keeps improving. Phrase your question as a question and follow it with a question mark. Donald R Strong (2008) Ecologists and environmentalism. Frontiers in Ecology and the Environment: Vol. 6, No. 7, pp. 347-347. “Environmentalism needs serious discussion by ecologists…. Whereas ecology is science and environmentalism sometimes is and sometimes isn’t, the latter is necessary for the former. We ecologists have the same relationship to the subject of our studies as do art historians and archeologists to theirs. There is no opprobrium upon artists and archeologists advocating for the preservation of art and antiquities. Protection of the environment – environmentalism – is advocacy of what we study. Why should we not advocate for protection of the environment in our professional capacity? Well, we will never know until the fossil-fuel paid and ideologically motivated denialists acknowledge physical reality and 1)admit that fossil fuels are finite, so that our energy infrastructure is in need of reinvention; 2)admit that same infrastructure is permanently and adversely affecting the planet’s climate. Now why don’t you take your concern trolling to a less intelligent audience where it might be effective. Public sentiment is everything. With public sentiment, nothing can fail; without it nothing can succeed. Consequently he who molds public sentiment, goes deeper than he who enacts statutes or pronounces decisions. He makes statutes and decisions possible or impossible to be executed. Davos, Natural Gas is not a solution, Natural Gas is part of the problem. Icarus #19, please refer us to some peer reviewed literature showing that biochar can be a significant mechanism for carbon sequestration. It appears to me that all biochar does is slow the emission of CO2 from biomass like trees that would otherwise rot. Trees which should be left growing/standing as long as possible regardless. And it takes energy to conduct pyrolysis. As with CCS (carbon capture and storage), biochar has the odor of pseudo-science or at least of technologies that fail when scaling up is attempted. Davos #24. I am active in the debate about biomass. It is my considered opinion that with few exceptions (maybe algae), it is neither carbon neutral nor capable of replacing significant quantities of energy on a sustainable basis. Burning it to make power is also a large public health risk factor. That’s short term, of course. Yet coal’s share of the electric generation mix has been falling for several years now; it used to be 52% or more. Now it’s 46% and falling–not fast enough, but falling all the same. The best part of that is that there’s every reason to expect that trend to accelerate. Your attack on whom you are calling “environmentalist” is long on assumptions and short on specific examples. One way to combat AGCC, improvements to energy efficiency, was noticeably missing from your list of “NIMBY hypocrisy.” That omission is also found in most statements from the big energy corporations and their investors, because energy companies cannot make money on energy conservation. Was that a coincidence? Without specifics, your attack has little merit. The point is that you collect the gases from biomass, which otherwise would compose,rot and are already part of the carbon cycle anyway. It’S called BioEnergy and with Biochar in the process BECCS. In January 1991, Sweden enacted a CO2 tax of 0.25 SEK/kg ($100 or EUR 72 per ton) on the use of oil, coal, natural gas, liquefied petroleum gas, petrol, and aviation fuel used in domestic travel. Industrial users paid half the rate (between 1993 and 1997, 25% of the rate), and certain high-energy industries such as commercial horticulture, mining, manufacturing and the pulp and paper industry were fully exempted from these new taxes. In 1997 the rate was raised to 0.365 SEK/kg ($150 per ton) of CO2. In 2007, the tax was SEK 930 (EUR 101) per ton of CO2. The full tax is paid in transport, space heating, and non-combined heat and power generation. Owing to the many exemptions, oil accounts for 96% of the revenues from the tax, although it produces less than three-quarters of CO2 from fuel combustion. I don’t remember saying that continued coal use is inevitable. I wish it weren’t. It also seems that when another point is brought up (relevantly), it’s left unengaged with the use of links. Of course you can link to ‘other folks’ and ‘ecologists’ that are willing to look at the damage done to various green-energy projects by environmentalists that are prioritizing NIMBY concerns over that of the value of these initiatives. I’m talking about the direct engagement of this subject from the leading advocates in the field of climate science. That’s my ‘no one’. Think about it. If those who know about the fate of inaction in green-energy initiatives in this present day stand up in city council meetings to quash the installation of a wind farm in their town (trust me, it’s happend) because of xyz, then they are demonstrating that xyz is of greater concern/importance than the future of the planet. This produces a counterproductive harm to the whole operation. “Concern-trolling” bah! … Gut-check time… Go down the list of these ‘wedges’ … Nuclear, natural gas, biomass, (and to a lesser extend wind and solar), etc. Which of those are you going to actively campaign to be installed near your home (or at least not prevent their installation)? Which one? I myself worked actively for the installation of a (construction-waste) biomass facility less than a mile from my house. It passed through one city council regime, got held up in court, then got rejected by a new city council regime. The figure-head of the vocal opposition was lead by a local meteorologist…Very well informed, and well presented (like most environmentally concerned folks). In the end, millions of dollars went for nothing and the developer is spooked about trying again. ANY energy generation facility has things no one wants and no one likes. It’s truly sad that there are so many people out there (and perhaps even reading this) that, to quote Ray: “acknowledge physical reality, and 1)admit that fossil fuels are finite, so that our energy infrastructure is in need of reinvention; 2)admit that same infrastructure is permanently and adversely affecting the planet’s climate.” and yet STILL would absolutely refuse to permit a green-energy installtion of one or all the types specified in Socolow’s wedge strategy. Flame all you want…but deep down, it’s true. To get the type of mass-deployment necessary, it’s going to have to affect your neighborhood too, and you’re going to have to SACRIFICIALLY let it happen. Perhaps being first will motivate others to come in line. Jim, apparently the chunk of information was from the Mitigation study published in nature, in response to post #31. This is exactly the kind of information about technologies, which are required to reach emission targets. And in order to answer the question raised in post #31 from “Toby Thaler”, you have to post the abstract of this paper to answer his “concerns”. But since that is not wanted here, i leave you just with the exact linkage. Here you can read about the energy which is required to power the fast and slow pyrolysis process. I’m a bit baffled why, what i consider small chunks of information, are removed at RealClimate. I never said that none of those energy options/alternatives don’t have issues or problems. I am in agreement with you about various energy types (aka nuclear) that are “fraught” with problems unrelated to AGCC. One of my points is the following: If you therefore elimate each of these energy sources that have these problems, what do you have left? How would Socolow’s wedge theory really work? If we’re supposed to be in the business of identifying strategies or evaluating the science, wouldn’t a truly critical look at this paper identify a lot more problems with it? Can we get there with energy efficiency improvements, solar, and windpower? Really? Or…instead…what’s more important? Socolow’s wedge project identifies a path to a destination. If we decide the destination is not worth the ‘other environmental problems’, then we run the risk of convincing others that the destination is also not as important. You could create a network of local groups that would rather see “inaction” on a local level when it comes to a number of energy initiatives. Is the “cost” of this inaction not high enough to outweigh its local “benefits”? If so…then apparently Socolow needs to redo his wedge theory, and concentrate on what’s left that’s ‘acceptable’. If not, then there needs to be a heckuva lot more sacrifice at the NIMBY level. I believe the issue of sequestration is addressed therein–among many others. We who ‘know’ or are members of the ‘Investment Class’ should all do what we can to drive home the point that Trillions of Dollars of assets are at risk from rising ocean levels; as that’s one of the most ‘no-doubt-about-it’ (because it is the longest termed) observations that’ve been made in regards to our Changing Climate, and they well know that at least 70% of the Total Insured Assets – or, to put it in a clearer light, a slice of the Portfilios Net-Worth too large for them to wish to lose – are within the predicted inundation zone. Perhaps the one “saving grace” of Alberta’s Tar/Oil sands is that it’s restricted to a single, relatively small jurisdiction. Because of this, complete exploitation of the resource over then next century is virtually impossible because Alberta doesn’t have the capacity to do it even if you allow for a a very high rate of growth in development (i.e. quadrupling production rates over the next 20-30 years). This wouldn’t be the case if the resource was distributed over a number of jurisdictions around the world. Even at 5 million barrels per day, it will take about 100 years to exploit even the 10% (170 billion barrels) that is currently considered economically recoverable. Furthermore, if you consider that 1 barrel of crude oil includes 86.5 kg of Carbon, and allow for an extra 20% to reflect the increased energy required, 170 billion barrels of tar sands translates to 17.6 gigatonnes of Carbon (GTC), which in turn translates to about 8.3 ppmv CO2 (not including any carbon being absorbed by the oceans). I believe Hanson does a disservice when he uses the “200 ppm CO2” statistic without putting it in context because it’s relatively easy to show that this number is almost meaningless. I fully support maintaining pressure on tar sands development because it is important that exploitation of the resource never gets above a few million barrels a day, if not much less. It’s a resource that needs to be limited to being used to help transition to a carbon-free economy. But there are a myriad of good arguments for keeping development at relatively small scales without worrying that stopping the development is “a key to whether we will take steps to get carbon emissions under control”. If anything is a key it’s putting a high price on carbon. The implications of failing to stop Keystone pales in comparison with the implications of continuing to keep fossil fuels the cheapest source of energy. Re biochar, #38: The paper you cite makes my point. From the abstract: “In this paper we estimate the maximum sustainable technical potential of biochar to mitigate climate change. …12% of current anthropogenic CO2-Ce emissions.” (my emphasis) And without doing the research, I hedge on my acceptance of the authors’ calculations, especially with regard to full cost accounting (carbon budget). Regardless, the realistic potential is likely to be far less than 12%. As with CC&S, I’m not holding my breath to see biochar become a significant contributor to carbon sequestration. Biochar proponents have been pushing it for years, and I have yet to see any major effort to scale it up. Am I missing something? For what it’s worth (lowly policy analyst that I am), my opinion is that our lifestyles are going to change, either by choice for by necessity. There is simply not enough quality energy (see EROI) to sustain the current level of consumption. Whether this ramp down occurs before global economic and social systems collapse (or at least have major crises) due to environmental stresses is open to question. If past performance is used as a predictor, I would say probably not. Perhaps I have missed it, but I have never seen much evidence that F.D. has read much about climate science. There is evidence that he is by no means the only senior scientist who relies more on prejudice than hard work when considering topics outside his or her expertise. Regarding your comment, it is rather hard to challenge F.D. because he says so little. For example his latest argument is not about the science, but an unsubstantiated political assertion that the Democrats would improve their chances by following his example in disregarding the majority of the research. Is their any evidence that some politicians have already made such calculations or is it just a question of voting strengths? His second political argument is similar to that of Bjorn Lomborg i.e that mitigation would discriminate against the poor. That risk does need to be addressed but it is not the subject of this thread. They have done this despite knowing that it will be terminal for their election prospects in 2013.. They do not care, placing the greater good as the important outcome. All members of the Australian government are to be congratulated for remaining steadfast against a hostile opposition and Murdoch press. For those that may be interested, Australia has introduced legislation for a carbon price, the so-called Clean Energy Future. It has passed the lower house (minority Labor government with the support of the Greens and independents) and is expected to pass the senate shortly. The policy aim is a reduction of CO2 by 5% on 2000 levels by 2020 (business-as-usual is expected to be 124% of 2000 levels by 2020). The headline is that it will introduce a price of $23/ton, (applied to the top 500 polluting companies), increasing by 2.5% above inflation until 2015, when it becomes a floating price. There are significant subsides to affected industries, notably the steel industry. Price rises for the average household are expected to be $10 per week. Compensation to households via tax cuts and pension increases offset this by $10 per week. Lower income households are over-compensated, higher-income households are under-compensated. The federal opposition Liberal/National* party coalition strongly opposes the introduction of the carbon price and promises to repeal the bill should they win government at the next election. * The Liberal Party in Australia is actually a conservative party whose philosophies are more in line with the British Conservatives of the USA Republicans. The name sometimes confuses international readers! We have been over the following before here on Real Climate, but this time note that the irregated forests eventually mature and then the resulting wood could be converted to biochar for long term sequestration. The proposed wind farm off of Cape Cod is a grand example. The Kennedys, amongst others, don’t want their views altered. They seem to think that other people’s views should be altered but not their own. This project also highlights the high cost of offshore wind power. Cape Wind will sell intermittent power at around 20 cents per KWH wholesale, which is more than double the price of non-intermittent power – and that’s after huge subsidies. So are we willing to ruin our views and triple the cost of electricity? What choice do we have? Nuclear/Thorium? Oops, there’s another example where environmentalists have impeded a low-carbon alternative. Besides, what is the benefit? There are plenty of countries in the world, and most of them don’t have the luxury to absorb a tripling of energy costs. They’ll scoop up any fossil fuels we don’t use. India’s stance is fair and logical. They say they’ll keep per capita CO2 emissions no higher than the USA’s. The result? Most fossil fuels will be used up. Saudi et al aren’t going to stop selling their only product! Tar sand pipelines and increased drilling is the plan for Obama’s USA! Reducing fossil fuel production (and it’s production, not consumption that is key) will always be “a good idea, but not right now, and certainly not for us”. Oil costs $6-$40 and sells for $100. Who’s going to stop producing with those numbers? Renewables, uranium, and thorium will only be used to make up for increased energy demand and the inevitable decline in fossil fuel production as resources get depleted. In the end, the cost of inaction might be minimal. Each additional ppm of CO2 is less damaging to the atmosphere than the previous one and we’ll end up tossing sulphur in the atmosphere to compensate as best we can. Geoengineering is cheap, and cheap wins. Let’s just hope that ocean acidification doesn’t kill off too much sea life. Anyway, sorry for the misattribution. Aging technocrat Freeman Dyson is well outside his area of expertise – an argument for treating scientists as humans with the usual share of foibles. It is unfortunate that the denial industry has figured out that they can shoot little darts in all directions and get those working on solutions to mistrust each other. This is not surprising or new in propaganda expertise. I’m not saying we’re not prone to building too many walls around our positions, just that all too often the comments are a disingenuous or naively adopted from sources whose motives are hidden enough to deceive. It’s getting increasingly unrealistic to keep pointing away from the catastrophic nature of consequences already under way (water, food, and vast numbers of homeless around the globe), though I can see it’s not very helpful to just stand around saying doom doom doom. The gold dust being sprinkled about is stupid and dangerous, but the chances of anyone giving up their accelerating “need” for entertainment, comfort and unnecessary conveniences are slim to none.